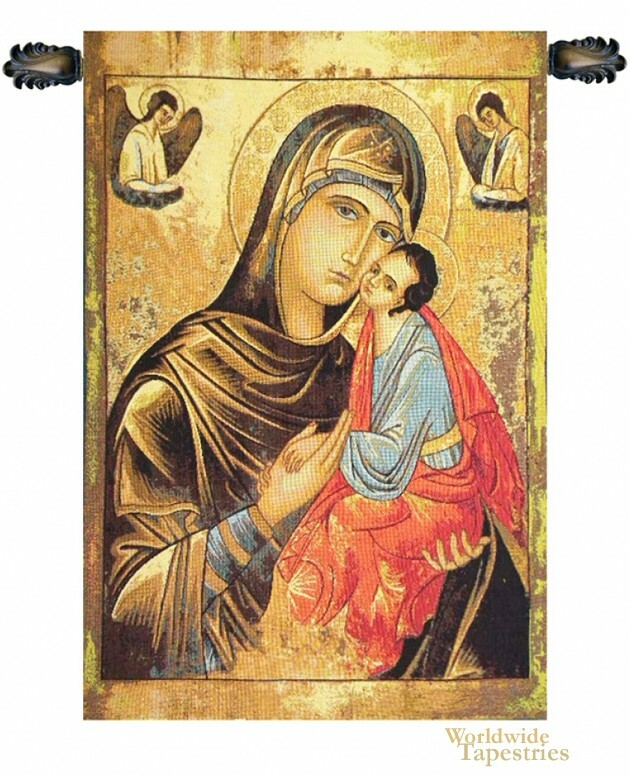 Greek Madonna wall tapestry shows the mother Mary and her Christ child in Greek Orthodox style. Here we see the Virgin Mary in a hooded gown and the Christ baby in elaborate garments on a gold background, accompanied by angels on both top corners. Since the medieval period, through the Renaissance and beyond, the iconic Mary and Child has been the subject of Christian art and has produced a variety of art styles including this iconic version. Greek Madonna tapestry is backed with a lining and a tunnel for easy hanging. Note: tapestry rods and tassels, where pictured, are not included in the price. Dimensions: W 17" x H 22"